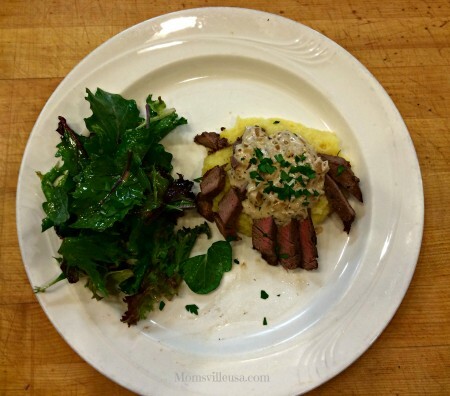 Gourmet Cooking for Beginners-Filet Mignon with Mustard Cream Sauce. How delicious does that sound.. even for this girl who tries to avoid red meat and anything with cream! This is what we were cooking up in Week 1 of the 8 week-long culinary camp I just started at Nothing To It – a culinary school in Reno, Nevada. And let me just say, it was surprisingly easy to make, and that’s coming from this novice, aka “non cook,” aka “lovable mess in the kitchen” (husband’s nickname for me), aka “I make good reservations.” So, if I can do it, anyone can! Just for the record, I did make it again at home just to prove to myself that it was not a stroke of good luck! My kids (ages 4 and 10) ate it and liked it! Enough said! The recipe for Filet Mignon with Mustard Cream Sauce is pretty easy to follow. A good chunk of my time was spent on preparation – cutting those darn shallots. The kids kept looking at me and asking why I was crying. Note to self – I need onion goggles! Or maybe I see a future kid job here or would that make me a mean mom? Otherwise, I think a more experienced cook could probably chop the shallots before the flood gates open. In class we paired the Filet Mignon with instant polenta in chicken broth, field greens with a Simple Vinaigrette and Poached Pears in Cookie Tuiles. I’ll share those recipes in another post. If you do decide to try the Filet Mignon with Mustard Cream Sauce, let me know what you think of the recipe or if you make any adaptations! Serve with roasted potatoes or polenta and fresh steamed green beans or a salad and you will have the most amazing meal. Heat a medium sized saute pan over medium high heat, and add vegetable oil and 1/2 tablespoon of butter. Lightly salt and pepper the filets. Add filets to the pan. Cook until brown, turning once.Reduce the heat and cook until you have the desired doneness, about 6 minutes for medium rare. Transfer the filets to a platter and tent it with aluminum foil. Repeat with any remaining filets. Add remaining butter to the pan and melt it over medium high heat. Remove the pan from the heat and add the brandy. Return the pan to the heat and bring it to a boil, scraping off any brown bits in the pan. Continue boiling until the brandy reduces to a glaze. Add the cream and boil until the mixture begins to thicken. Add in the mustard and remove from the heat. Season with salt and pepper. Place streaks on individual plates, spoon sauce over them and garnish with some freshly chopped parsley.